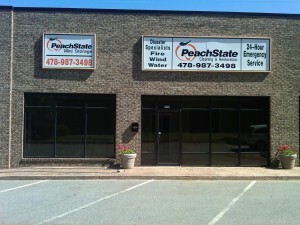 PeachState Cleaning & Restoration has been serving the middle Georgia area since 2003. The company is locally owned and operated. Our team takes pride in the business we have built on a solid foundation of more than 35 years of combined experience in the industry. When you call on PeachState, you can be confident that you are calling a dedicated team with extensive experience that lives in the area and takes pride in helping neighbors overcome disastrous situations. The PeachState team makes every effort to stay on top of leading restoration techniques by participating in continuous education classes every year. We are IICRC certified. IICRC sets the guidelines for the restoration industry. Additionally, we are certified in water extraction and drying, advanced structural drying, fire, smoke and odor control, and mold remediation. And, we are licensed general contractors in the state of Georgia. PeachState is led by owners Jeff Dehem and Rodney McCart who are supported by the best team in the industry: Mark Brannen, Co-owner Eatonton location; John Jones, Project Manager; Mike Bachman, Remediation Supervisor; Rachel Coan, Office Manager and an unparalleled group of exceptional sub-contractors. Jeff lives in Perry with his wife and two children. They are active members of the community and Perry United Methodist Church. Jeff is a graduate of Valdosta State University with a BA in Marketing. Prior to joining PeachState, Jeff worked as an insurance adjustor and was also co-owner of another insurance restoration company in Macon, GA.
Rodney lives in Macon with his wife and two children. They are also active members of the community and attend Ingleside Baptist Church. Rodney graduated from Georgia Southern University with a BA in Finance. Rodney was raised in the construction business and worked for an insurance company for 10 years before purchasing PeachState in 2002. The PeachState team takes pride in each and every job. We enjoy what we do, the team we work with and the customers we serve!